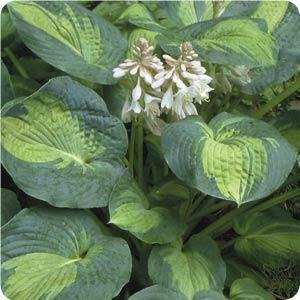 Description: Great Expectations Hosta has large leaves that are rounded and a little cupped. They are deeply corrugated with a creamy white to yellow center and a blue-green margin. In early summer they sprout pure white bell-shaped flowers on tall sturdy stems high above the plant. Hostas are extremely popular, hardy herbaceous perennials grown primarily for their beautiful foliage. They are easy to grow, shade-tolerant plants. The plants are low maintenance. Hostas originally came from Japan, China, and Korea. They were first introduced to Europe in the late 1700s and then came to the United States in the middle 1800s. Height: Grows 18″ to 28″ tall. Outstanding Features: Plant Great Expectations in full shade for best color.